My email inbox has been getting flooded with events lately as it seems like this is the time of year when so much is going on. Sometimes it can be hard to keep up with. But I was delighted when I received an email reminder today from the USC Charlotte Gamecock Club about the Gamecock Fan Fest Tour. 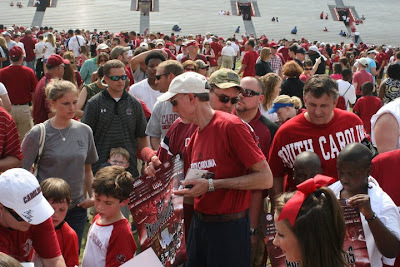 The tour kicks off this Wednesday, May 11 at Charlotte Knights Stadium in Fort Mill, and is traveling across the state of South Carolina to promote the 2011 football season, making six stops over two weeks. Lucky for us South Carolina Gamecock fans and alumni who live in Charlotte, Fort Mill is just over the state line. With the success of the Fan Fest held at the Garnet and Black Spring Game in April, the Gamecock Club decided to take the show on the road. Photo via South Carolina Gamecocks' Flickr. Presented by the Gamecock Club, each tour event will last from 5:30 to 8 p.m. and will feature Coach Steve Spurrier, current student-athletes from the local area, Cocky and the cheerleaders, photo opportunities with football and baseball trophies (SEC Eastern Division Championship in football and National Championship in baseball), kids activities, and live music from Tokyo Joe. Admission is only $5.